First, a big congratulations to Travis Langley, winner of the MyFolsom Football Madness Pickem' Pool. 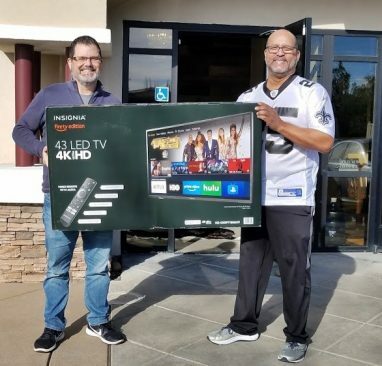 Travis beat out 61 others to win the grand prize, a 4k Ultra HD Smart TV. FLB - Folsom Lake Bowl's Sportsbar - With 3 dozen HDTVs drink specials, food specials, prize giveaways and a great atmosphere this is one awesome place to catch the game. Adults only. Canyon Grill and Ale House - Now under the new ownership of Eric and Christine Spencer, the Grill will be having special wings representing each team. A whole bunch of beers on tap, and plenty of room. Family friendly. Folsom State Slickers - A big space with fun bartenders and outdoor space, this is one of Folsom's hidden gems. Check them out. Adults only. Skipolini's Pizza - Their covered patio, shaded on sunny days and keeping you dry when it rains, is perfect for anyone wanting an outdoor experience. I think they've got 6 TVs out there. You can go inside and hang at the bar as well. Family friendly. Menu has something for everyone. Buffalo Wild Wings - Big, family friendly, tvs everywhere, and they've got a ton of wings... literally. That Mango Habanero though. Chicago Fire - Among the best pizza and wings in the region. Chicago Fire is family friendly and always a good time. Powerhouse Pub - 2 new big screens, barbecue, drink specials and great bartenders this is one of my favorite spots. The Back Bistro - Nothing planned for Superbowl, and they've got their TVs over in the far corner. Why are they on the list? Well first, they were a sponsor of our football pool, but second, the bar and restaurant are big enough for those who DON'T want to watch the game. So there you have it. Whatever you do, be safe! Superbowl is a day where too many people lose their lives or end up in jail because of drinking and driving. There's no excuse. Walk, hitch a ride, take a Lyft or Uber, and party up, but don't drink and drive! Last thing, I'm still hurting over that blown call against the Saints. I don't know who to root for.